Posted by admin in media, volcano culture. In a memorable post at Eruptions at the start of the year, Fearmongering Gets Started in 2012: Laacher See is Not “Ready to Blow”, Erik Klemetti reported on a story in the Daily Mail (which, for those who remain blissfully unaware, is a UK newspaper), headlined ‘Is a super-volcano just 390 miles from London ready to blow?’, which claimed that the Laacher See caldera in Germany was ‘showing worrying signs of waking up’ on the grounds that (1) it erupts every 10,000 to 12,000 years ‘and last went off 12,900 years ago, so it could blow at any time’, and (2) CO2 bubbling up through the lake ‘indicates that the magma chamber below is degassing’. Pulling no punches in his attack on this nonsense, Dr Klemetti calls the article ‘tremendously terrible’, ‘substance free’ and ‘irresponsible, lazy journalism at its finest’. I haven’t linked to the Daily Mail article itself because it’s gone. A further post by Erik two days ago explains why: Daily Mail Required to Remove Laacher See Eruption Fearmongering. It seems that a complaint was made to the UK press complaints body, the Press Complaints Commission (PCC), on the grounds that the article ‘had breached Clause 1 (Accuracy) of the Editors’ Code of Practice. The complainant considered the assertion that the volcano was about to erupt had not been supported by sufficient evidence or expert opinions’. The PCC ‘resolved’ this complaint by negotiating the removal of the article by the Daily Mail. It’s good to see that this particular piece of scaremongering rubbish has gone, but it’s important to note that (1) no admission of fault has been made by the Daily Mail – when the PCC ‘negotiates’ a resolution the process involves no direct admission by the publication concerned that it did anything wrong, so it’s neither a victory for the complainant nor a defeat for bad journalism; (2) that the Daily Mail is required to give no explanation or correction of the original story, just quietly to ‘disappear’ it, in accordance with the cosy way the PCC’s model of ‘self regulation’ works; and (3) this is one ‘resolution’ pertaining to one story, which sets no precedent and provides no guarantee that this kind of story will not appear again in this publication and in others. Indeed, let’s be honest, we all know we are going to be seeing a lot more of this kind of thing because it sells papers, and the titles concerned (by no means limited to the bottom end of the market) have no conception that there is anything wrong with it. As it happens we may not be seeing the PCC ‘resolving’ complaints this way for much longer. The Leveson Inquiry is currently conducting a wide-ranging investigation of ‘the culture, practice and ethics’ of the UK press, and (while Lord Justice Leveson himself has been very careful not to commit himself to any specific future course of action) it is highly likely that the replacement of the PCC, and possibly the complete reform of the current ‘self regulation’ model, will form a part of the Inquiry’s ultimate recommendations. It’s very encouraging to see that one of the areas Leveson is looking at is the way science is reported in the press. In January the Inquiry heard from Fiona Fox of the Science Media Centre (her evidence before the Inquiry can be found here, beginning on page 5 of the ‘Transcript of Afternoon Hearing 24 January 2012’ PDF) who spoke very eloquently on the power of the media in informing the public about science and the consequent responsibility of the media to get its facts right. An instance of the kind of irresponsible and misleading sensationalism she was warning against had been provided earlier in the Inquiry by Dawn Neesom, editor of the Daily Star (a tabloid), who was challenged over a front-page spread headlined ‘Terror As Plane Hits Ash Cloud’ and featuring an image apparently of a plane with engines spitting fire as it plunged through a dark grey ash cloud. This was published on 21 April 2010, at the time of the Eyjafjallajökull eruption and associated airspace closures, and apparently caused such alarm that the paper was removed from sale in airports. 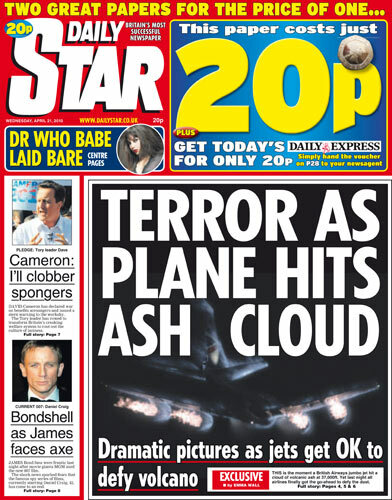 The picture was of a non-existent event: it was a grab from a TV documentary’s computer reconstruction of a notable ash cloud encounter which took place in 1982 (Neesom’s evidence is here, the ash cloud story is discussed on page 14 of the ‘Transcript of Morning Hearing 12 January 2012’ PDF). The Daily Star later apologized for this story, up to a point. Apropos of Eyjafjallajökull coverage specifically, it is interesting to see that a new paper in the Journal of Geophysical Research examining newspaper coverage of that event reports that of 669 quotes used in the press reports only 9% came from volcanologists, and volcanological pieces were placed ‘well down the reporting order’. The subtext appears to be newspapers chose to emphasize chaos and disruption because that makes for a better story (disclaimer – I haven’t yet read the J. Geophys. R. paper, only the abstract). Volcanoes are only a small part of media science coverage, but at times a very high-profile one, and it’s vital that every pressure is brought to bear on the media to provide responsible, soundly based and informative science coverage in this area as in others. In that respect the internet has an important role to play, and Erik Klemetti in particular deserves praise for his ceaseless war on media scaremongering at Eruptions. It is a crucial issue, for, as Martin Robbins put it yesterday in his Lay Scientist blog at The Guardian, ‘Bad science reporting isn’t just an irritant to nerdy pedants like me, it’s something that risks people’s health and undermines their ability to make informed choices’. At one end of the scale, it’s depressing when newspapers reporting on volcanic activity can’t be bothered to get a picture of the right volcano. At the other, things get dangerous when ignorant fools are given space in respectable papers to claim that volcanic ash poses no risk to aircraft. The media has responsibility to inform itself before presuming to inform others; and its duty to get things right is precisely proportional to its power to shape public discourse. Very well said indeed. “The media has responsibility to inform itself before presuming to inform others” is perhaps the most succinct summary of the ongoing inability to accurately present science stories I’ve seen. Public discourse about science/technology issues typically interests (humanities-trained) journalists only for its socio-political ramifications. Most of them find pure science unrelateable and even uninteresting–the purview of nerds. Which is why it doesn’t bother them at all to print egregious “news” items like that Daily Mail article. For them, science is nothing more than an ‘exotic’ field they can use to generate public frenzy. And call attention to themselves–maybe win a Pulitzer, if they’re lucky–while they’re at it. I fear you are quite right about the sensationalist concerns of many journalists. But I hear the contention that ‘humanities-trained journalists’ are too ignorant of and scared of science to report it properly a lot, and I don’t think it suffices as an explanation. Ben Goldacre may be fond of saying that, but it seems to me to be a lazy assertion that just perpetuates the very humanities/science divisions and prejudices that we have to overcome. Good training in the respectable and academically demanding subjects normally considered the ‘humanities’ should give someone the intellectual apparatus to research, understand and communicate what matters in any subject, whether it’s science, engineering, politics or whatever. You just have to make the effort. If many journalists don’t that’s not because they are irredeemably ‘humanities’ people: it’s because they are no good at what they do. Are that many journalists ‘humanities-trained’ anyway? A lot of them these days seem to be essentially ‘journalism-trained’ or ‘media-studies-trained’. I don’t know whether that’s a good thing or not. I would have thought the core skills of good journalism should equip someone to write effectively about science as much as about sport, military hardware, foreign policy or the opera.